Today - beautiful weather for cafe sampling. The jewish museum had to be done as we seem to collect them wherever we go. Tiny but remarkable for the Daniel Leibskind creation within the old Royal Boathouse building. He was taken the Hebrew letters for the word Mitzvah meaning good works to commemorate the rescuing of the Jews by the Danes in WW2 and then used the shapes of the letters to create the design of the corridors with sloping walls reflecting the planes of the letters so that the building is itself text. Also found a dedicated quilting section in a three story hobby shop - but sadly too expensive to indulge in prints as they work out at around sixteen - seventeen pounds per meter. Bizarely however their plains are very cheap at two pounds fifty per metre so the plan is to go there en route to the airport and spend all remaining kroner! Yesterday the forcast was sun with showers. We wandered to the tour boat quay and found that the clouds had receded and the sky was blue. So on the open top boat we hopped, very surprised that the hours cruise costs less than a coffee , all drinks here being very expensive. And lovely it was around Nyhaven and the sheltered canals by the expensive apartments of Christanhaven. Then, the moment we got out onto the open water of the outer harbour the rain hit. Cold driving rain. Basically for the remaining forty minutes I hunched down between the bench seats the mercifully large hotel umbrella serving as a tent balanced on the seat backs. Each time the sodden guide announced something worth looking at I'd raise it a tentative inch have a peek then hunker down again. I nearly got decapitated at the end when we went under an extremely low bridge and only just got the brolly down in time as by then my fingers were so cold they had stopped working. It was only when we got off that Dennis who was on the seat behind me confessed that all the rain was dripping off my 'tent' onto his trousers. I came off dry and even his boxers were wet! I am such a bad wife! Still, the Danes obviously cater for such weather as their outdoor cafes supply not only braziers but blankets as well so were were able to eat outside in warmth for lunch. It is amazing how much of a language you can pick up from signs and menus and in Den's case from watching Notting Hill with Danish subtitles whilst I was last blogging. When I went up he knew the Danish for such useful phrases as 'Ooops a daisy', 'groovy', and 'there are pictures of me naked all over the British press'. Today was forecast as thunder and lightning and has been sunny and warnm all day. We went to the fanous Tivoli Gardens as it opened at eleven to find that the gardens are no more than flowers in concrete planters and surrounds and that none of the attractions or 46 restaurants opened until between twelve and two thirty. We were not amused having paid seven /fifty to get in and watch staff brushing litter up because that was the only activity. Still, this being me we ended up with a full refund and a pass to go back in free later! By this time I little fed up with Copenhagen we decided to go to Sweden for lunch and got the train to Malmo, almost, but not quite, resisting the urge to hum 'Waterloo' as we disembarked.. Lunch was had under two blankets in a pretty square but Malmo is like any other pleasant European town really. You could be anywhere. Save that I was a bit stumped when I read my first menu and realised that it wasn't in the Danish I have already come to expect. We also now have sterling, Euros, Danish Kroner and Swedish Kroner in our pockets and shops seem to happily take the latter three interchangably or even in combination if you are deperate. Tivoli was a bit more bustling on our return but is still vastly overerated but as we stumbled on a great Indian restaurant around the corner we are now full and happy and ready for bed. By the way if anyone reading this has emailed me and wonders why I have ingnored their response it is becuase I cannot get email here just access to this blog plage for some reason. Probably becuase my menu orientated Danish cannot cope with the messages about cookies that I think are what are flashing up all the time! Hello from a wet Copenhagen! We arrived this afternoon via London having called into see in see Placido Domingo at the Opera House (as you do). It was pouring when we emerged from the train from the airport which was a problem as my umbrella is in the taxi which took us to Covent Garden! Fortunately our hotel has guest ones so I have comandeered one as it looks like the whole stay here may be damp. We ate at the so called sunny and bustling area of Nyhaven. It was neither and food is exceedingly expensive here even by London prices but we are happily fully of an all you can eat grill. It being Sunday all shops are shut but in the block around the hotel I have already found two fabric shops and sewing machine centre and a bead shop. Also a book shop where a new trade paperback was showcased in the window for the equivalent of GBP 34.50! We had better hope that we dont run out of reading material as that wasnt even an English version. At least this internet access is free. Although in case you were wondering about the lack of punctuation, the keyboard is weird. Press for an opening bracket and you get a *. Press for a start and you get . Press for a question mark and you get _. Even the Danish bits do not work. The letter os here have a stroke through them and the keyboard has a key just for that , which gives me '. Oh ! I've been looking for that inverted comma everywhere! the exclamation key is where it should be. Go figure! I can see the end in sight with the novel. I have a final chapter to write but am saving that. I have now started the task of combining all my draft chpaters which are in individual files into one doing some basic editing as I go along. I remember this feeling of emerging from a fog of preparation into clarity from pulling togther university theses. So far however, I have not resorted to my student tricks of spreading all the pages over the floor and pinning lining paper to the wall with a huge flow chart on. (There is time though). I can also see the beginning in sight with the quilts. I am very proud of the biggest one I have worked on so far (see photo) - just the top so far, handpieced blocks with borders by the machine - I need to buy backing before I can quilt it. Plus I got my first commission today - my cleaner wants to buy a patchwork piece backed with fleece... for her dog's basket. Oh well, got to start somewhere I expect. And she does love that little doggie. Up we went on Friday to my parent' s in Penrith ready for me to take my two pieced quilt tops to the class at Morceau. I had saved the work to do there becuase when I first got my machine it chewed up the backing on a quilt when I attempted to machine qult. A replacement walkng foot was sent and on a small area on a bag it appeared to me fine but I was still nervous. 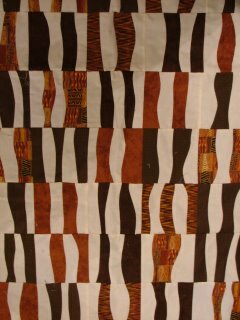 So, with 'teacher' The basted quilt was examined and we decided to go for one long curved line down the length of the piece in a gorgeous variegated 'King Tut' thread in shades of gold and brown which I bought at the Trentham Gardens quilt show. As soon as I started the machine jammed, the needle going up and down in place, no material being taken through the feed dogs. 'Teacher' was called and I was given a beginners lesson in how to straighten the fabric, not to pull or push it and a demonstration line of beautiful quilting was done for me. Personally I couldn't see what I was doing any different. So we swapped places, I sat down and within seconds of 'teacher' going to another student the machine jammed again. A second request for help lead to what I percieved ( I may be mistaken) to be a rather over patient 'OK let's deal with the idiot attention seeker' examination of my machine. Needles need to be changed. I have done. Yes, but When? At the start of class. Well put a new one in anyway. And machnes need to be cleaned. I know, I did it last night - and oiled it. Well, lets just look at it anyway. Oh yes it is clean isn't it? She had another sew. The end verdict - the machine is fine, it really is. By now I am very frustrated and annoyed and also embarrassed. This is a small class and it is clear that I cannot achieve the most basic of practical tasks. So 'teacher' is merrily sewing along and I am trying to be nonchalant and telling everyone that I have christened the machine Damien when - lo! ( isn't that a good word?) - the machine jammed for her, makes a neat but unwanted knot on the back of the quilt and reduces it stitch size to minute and probably unpickable. YES!! It is not me! I should I suppose have been happy but mortifyingly I burst into tears and had to go and stand on the stairs and regather myself. On return it was sugested that the next week I write a letter and see if they would swap the machine. I went outside at once, rang, demanded, quoted the Sales of Good Act and was met with scepticism that it really was the machine and not me. Deep breath and an explanation of the evidence I had which could be produced (' the quilt it has just chewed up that I spent hours on' and the numbers of witnesses to such chewing and a slightly better attitude was forthcoming. ("Well, I wouldn't take a barrister to the small claims court."). Unsurprsingly the best attitude came when I said that I didn't want another machine the same I wanted to upgrade to a better one as I'd bought a basic model to see if I liked quilting and now I am as addicted as Tomy Docherty perhaps I should get a better one at this stage. The next problem - all the people with authority in the company were in the Ukraine on a charity drive for Chernobyl kids. But ifI ring back on Wednesday having chosen a new model it shouldn't be a problem for them to collect the old one and deliver new at the same time. I should have been happy and I did get a certain satisfaction from the amazed look on everyone's face when I went back in with the news but by this time I had wasted a day and spoiled a quilt. 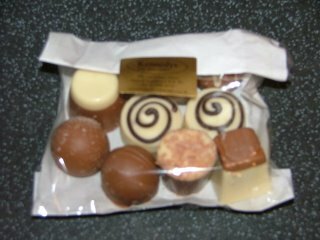 So there was only one thing for it - retail therapy in the shop downstairs. except that when I went to the patchwork section I realsied that the shop owner was in Loch Lomond at a show.... with most of her stock. Decided today to do a quick children's quilt. The first one I had designed myself. 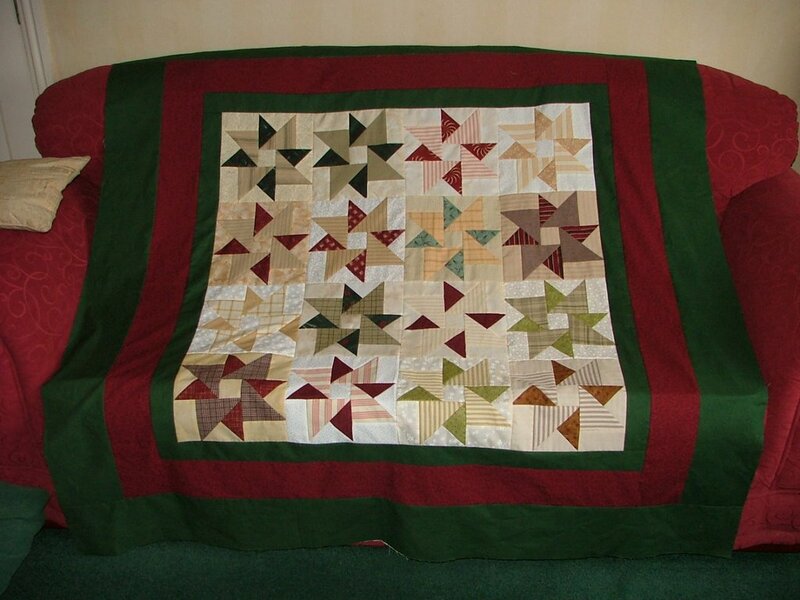 One that I would back with fleece ( so OK its not a proper quilt but you know what I mean). A quick one. So I finished my paperwork and started about four. I soon realised that when the instruction for half square triangles in my magazine said add 7/8 inch to the 'finished block' size it meant finished as in the size it would appear in a sewn up quilt. Not finished as in when I had first made two squares into two half triangle squares. So I was 1/2 inch two big. Which wouldn't have mattered had I not already cut solid squares out in the smaller size to attach later. So the first delay occurred in trimming 24 blocks down to size. Then came the problems with the red thread I used to machine applique. Bought cheap. I shall never use it again. I have too little knowledge to justify my theory that it was the thread to blame rather than me but it seemed to refuse to stay either in the needle or in the bobbin catch, slipping out every few inches. But I'd started so I had to finish. Then of course there were the phone calls. First: Mum, 'I have a problem Your Dad's been on the computer and now the printer is broken.' (Code in our house for 'I've forgotten how to use the computer'.) Twenty five minutes of blind instruction down the line she remembers that perhaps I've told her this before and that perhaps it is not my Dad's fault for breaking the computer. I start to tell the tale of measurement woe when her B&B guests arrive. Second call: they have gone. I finish tale of woe. She asks - if the video has 3 on it and a red light and is whirring is she successfully recording the match for Dad? Third call: She has sent me an email and in so doing the computer has 'all by itself' now printed the original item she couldn't print. Now she has 3 copies. Swap to cream thread. Same brand, same problem. Am now regretting not hand piecing. 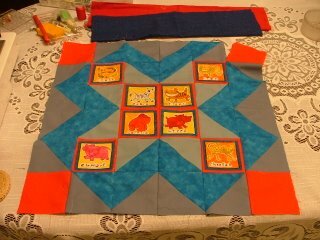 Eventually get the main pattern done of this Project Linus quilt and accept that the borders will have to wait. Triumphant, I bring it upstars to photo and it is then I notice just one block upside down. I have started to rectify it but gave up for tonight - so you can see above the troublesome half article and when it is finished I'll show you the difference. It has animal blocks so I've decided to call it On the Wild Side - the recipient child will never know the title had nothing to do with the animals at all! 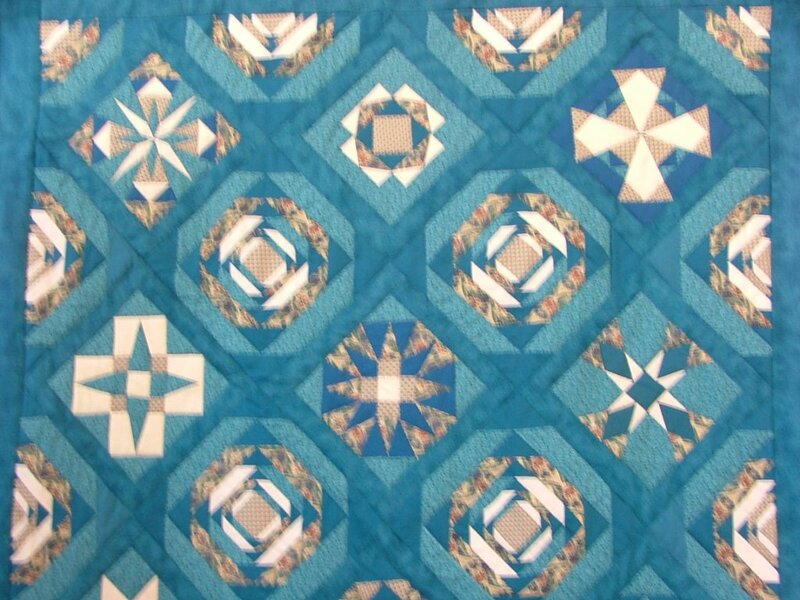 The photo below is a detail from the quilt I came home to work on. This is just the pieced top - I hope to quilt it at a class in Penrith next week. I need to get a move on as it for a present for a wedding on 4th June! Just as I put the first mouthful of my lunch in my mouth the phone rang. I should have ignored it but thinking it might be my husband I answered. It was a chirpy girl from the NatWest. 'Is it convenient to talk right now?' she asked. 'Not particularly, no,' I mumbed through granary bread. 'Oh, I'm sorry about that she said and proceeded to talk to me anyway. She had, she said, information to give to me. Fine. But first she had to take me through security. I refused to answer any questions on the basis that she had rung me and I had no idea to whom I was disclosing things. But she needed to be sure she was talking to me. I pointed out that she had rung my phone number and that I'd identified myself when I answered the phone and before I knew it was the Natwest but that wasn't enough. How could she send me the information she wondered? I suggested the post, to which she agreed reluctantly. I dedcied not to point out that she coudn't be sure who woud be reading the post once it arrived at my address. A couple of hours later the phone rings. It is Natwest. I point out that they have already rung me today. Slight pause. 'Oh well, I'm ringing now." (In case I hadn't notcied I presume.) they just needed to take me through some security. Patiently I explained why it was not particulary secure to divulge details over the phone to an unsolicited caller. 'Well you say that, " he replied, "but the only questions I need to ask you are the ones that you use to give you access to your banking online service, so I'm not asking you for any personal details." I thought you might like to share my lunch with me today: this is originally from the Good Food magazine's book of 101 Low Fat feasts ... with a novelists adaptations. Begin in study in state of desperation. Read and reread and read again previous chapters of novel trying to make sense of it and taking nothing in. Give up and go to kitchen. Add garlic and pumkin/ sqaush and fry for five minute. Take deep breaths and remember that there is no deadline for a first novel. Go back to study and bring chapter print out and scrap paper to kitchen. Spread over worktop and begin to scribble down the events that have to happen in the order that makes sense. Smell the squash burning. I said simmer not boil. Rescue and throw pasta into boiling water for time required on packet. Add the beans to the pan after another 7 minutes and drain pasta. Combine pasta and bean/squash mixture. Take notes and bowl of food into dining room. Clear small patch around quilting material and eat hot steaming conmforting food whilst examining the notes. Realise that the solution lies in separating one long chapter into two halves and placing other material between thsoe halves. Celebrate with two fairy cakes for pudding and vow never to have a two week break from a novel again. Leave dishes for later and retire to study to write a coherent plan. Write just enough to feel you have conquered the panic then turn to blog instead for ease. After completing blog pack and go to Cumbria for a talk about African fabrics followed the day later by a workshop on indigo dying. Leave remains of sauce for husband's tea or if circumstances differ freeze or water down for hearty soup.